Now, and for many decades past, the American public has displayed far higher confidence and trust in “The Military” than in any other “Institution” (including than churches, schools, the Presidency, the police, courts — any). And yet — according to the Inspector General of the U.S. Department of Defense — many billions, and sometimes even trillions, of dollars, in the Department’s periodic financial reports, are not documented. What has happened to the taxpayers’ money is unknown — it’s missing (alleged to have been spent, but to payees unidentified). On July 14th, Catherine Austin Fitts posted to her website links to some of the key relevant federal documents. Her site is linked-to below, and some of the documents that refer to trillions of dollars unaccounted for are also linked-to below, and are then quoted from, so that the reader can obtain a sense both of the enormity of the corruption, and also of the authoritativeness of the official statements that are being made here, regarding that corruption. I am using here the word “corruption” because whenever an official finding by a U.S. government agency is reporting trillions of dollars of taxpayer money that have been spent for purposes and recipients that are unknown, I call it “corruption” on the basis that, regardless of whether or not the matter is intended or is instead sloppiness, even mere sloppiness is heinous if it ranges into trillions of dollars of taxpayer-money missing or wrongly spent. Even sloppiness of that magnitude, in the expenditure of taxpayer funds, reflects corruption if it continues on for years, or especially (as it is shown to do here) for decades, and still has not been stopped. Inspector General U.S. Department of Defense Report No. DODIG-2016-113 JULY 26, 2016 Army General Fund Adjustments Not Adequately Documented or Supported. 7. L-3 Communications Holdings Inc.
10. Huntington Ingalls Industries Inc.
15. General Atomic Technologies Corp.
19. Booz Allen Hamilton Holding Corp.
20. United Launch Alliance L.L.C. 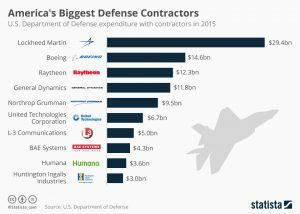 As is obvious, all or almost all of these firms are contractors to (recipients of money from) the U.S. Department of Defense; and they may reasonably be presumed to be benefiting significantly from some of the unaccounted for payments from the U.S. DoD. However, if the money isn’t going to them, then where is it going? And why? And for what? Why is there no congressional investigation to answer these questions? And why are U.S. ‘news’ media not publicizing this matter so as to force such investigations? Are payoffs involved — payoffs for silence? Why are none of the ‘news’ media that have the resources to explore these questions publishing their own investigations into it, since Congress won’t investigate? And, since the Inspector General’s reports into these matters have had no impact, why isn’t the focus finally shifting away from studying to find out how much is missing toward, instead, prosecuting the people who — at the very least — failed to do what they were being paid to do: keep track of every cent of taxpayers’ money? If doing that job is too dangerous, then shouldn’t the people who are tasked to do it be paid more, so as to cover their exceptionally high personal risk? Is all of this secrecy really necessary in order to keep “The Military” way on top as the most respected of all institutions in the United States — even after all of the harms that the U.S. military has actually caused in Iraq, Libya, Syria, etc., destroying those countries and others? How much would the public’s respect for the military — the mass-killing institution — be brought down if the truth about it were known? Would the mass-killing institution deserve to be the most respected institution even if it weren’t so corrupt?